London bars and clubs: Your best options for a legendary night out! London’s Unmissable Bars, Clubs & Pubs! When it comes to the top bars and clubs in Europe, the city of London simply can’t be overlooked. There’s so much entertainment on the capital’s streets as it is, and sometimes there are some amazing bars and clubs that get overlooked by tourists – and even Londoners – when on a night out. If you’re thinking of visiting London, England in 2014, then a tour of the city’s best places to drink is a must, with some of the oldest pubs in the country laying roots in the capital for hundreds of years! Here’s a short guide to London’s Unmissable bars, clubs & pubs to kick start your evening in one of the world’s most spectacular cities. Lime can be found nestled in the suburbs of Palmers Green in North London, and having just undergone a complete refurbishment from its previous name The Live Room, this bar is a real eye catcher. With black and silver walls, stylish mirrors surrounding the seating areas, table service and smart, friendly staff, there’s no doubt you’ll have a night to remember in Lime, especially as the DJ plays the freshest hip hop tunes until the early hours! Call or visit their website to reserve a table. Moonlighting is another of London’s top bars/clubs, and it’s extremely popular with students on a Thursday night with drinks selling for £1.50! Situated in the heart of Soho, one of the capital’s trendiest boroughs, Moonlighting hosts a number of nights every week, with the busiest being Saturday. If you’re looking for great cocktails, a dazzling interior and old tunes as well as new ones, then Moonlighting is the place for you, and just like Lime you can call ahead and reserve a table – or even host a party there! Koko is one of London’s oldest venues, and to this day it remains a popular place to party with the capital’s youth in the heart of Camden. From NME nights to gigs and special DJ appearances, this is a great place to spot celebrities in the city, especially if a great band is playing. Koko is pretty big inside, with 3 levels overlooking the main dance floor. Furthermore, the club also puts on special student nights in the week (usually Wednesdays), meaning there’s a whole host of great drinks deals to take advantage of. Get discounts on tickets by booking online at the Koko website. Palmers Green has a knack for cool places to drink, and situated right across the road from Lime is the Wishing Well. 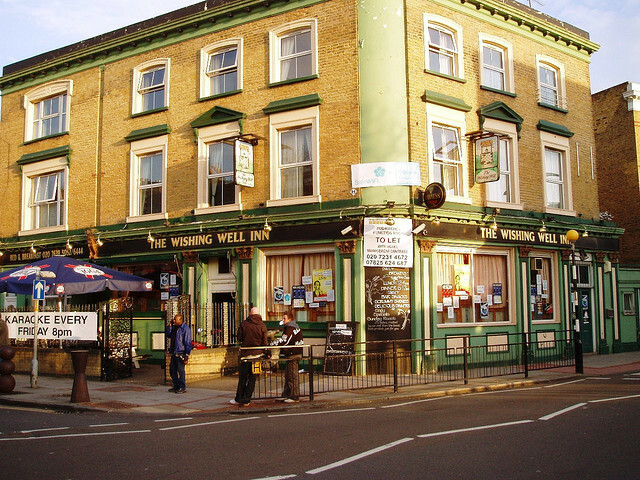 Home to some of London’s most seasoned Irish drinkers, the Wishing Well is as traditional as pubs come, playing live music most nights of the week and even supplying drinkers with sandwiches towards the end of the night! Furthermore, there’s an overground train station opposite the pub, meaning you can be back in central London in less than 20 minutes. Run and owned by manager Chrissy, she keep’s this establishment in tip-top shape, so get down to the Wishing Well and experience a true Irish pub at it’s finest! If you are looking for the finest London bars and clubs, you needn’t despair, as the establishments listed above will get you well on you way to one of the best nights out that you’ve ever had in your life! Don’t forget visiting Camden. With so many pubs and bars in the area, all packed with good quality live music, you really cannot go wrong at all!